Your retail management system is at the heart of your business efficiency. It keeps your operations smooth, make sure all parts of your business are always connected and in communication, and by consequence ensures that you can always deliver services and experiences that meet and go beyond your customers’ expectations. Despite the central role of retail management technology, many retailers are still stuck with legacy software, hardware and network systems that can’t sync information properly, are hard and costly to maintain and limit their abilities to deliver the services consumers demand. Although many retailers are afraid of the investment required by a new system, outdated tech may be already costing them more than a complete technology overhaul. Are you, like many retailers, losing competitiveness because of your outdated software systems? We have compiled a list of the top red flags you should look out for. If two or more of these points hit home, it’s time to get moving: you are in dire need of a technological upgrade. Today’s consumers hop across channels when browsing and shopping, and they expect to be able to return purchases the way they like, too. According to research from Shopify, 67% of shoppers check the return policy before buying from a retailer. What they are looking for? Two of the top demands are simple and easy processes (a third of online shoppers say they will shop less if returns are complex), and the ability to return items bought online to brick-and-mortar store locations, says a recent study by Forrester Research. "There are a lot of people who don’t even bother returning [products] because it’s such a pain, and when they don’t bother returning, they just don’t shop with you again,” says Sucharita Mulpuru, retail analyst at Forrester. Ask yourself: Does my current technology enable me to offer cross-channel product returns and exchanges? Or will I risk ending up with dead stock, and some accounting headaches at the end of the month? Click and collect – buying online and picking up the purchase in-store – is in high demand. According to data and analytics company GlobalData, the click and collect market is forecast to increase 55.6% by 2022, outpacing even the growth of online shopping. On top of being popular, click and collect also holds benefits for retailers, as it has been shown to lead to larger shopping baskets as customers add unplanned items when they go pick up their purchases. Ask yourself: Am I missing out on in-store foot traffic and larger baskets by keeping my e-commerce and physical locations disconnected? The IBM Institute for Business Value reports that 66% of consumers want to know that the item they are looking for is available before they head out to shop. No way for them to know what products are in? Then they may not even make the trip. Still, only one third of retailers give customers access to accurate product availability across store locations. 45% offer no access to inventory at all, according to data by Sapio Research. It’s not just consumers that lack the needed visibility. The IBM Institute for Business Value notes that 46% of shoppers expect store associates to be able to fix out of stocks instantly, for example ordering a replacement item on the spot. At the same time, less than 15% of retailers already give their staff effective inventory visibility across channels, according to BRP’s latest Customer Experience/Unified Commerce Survey. Ask yourself: Do I force shoppers to make the trip in person to find out if a product is available in my stores? And in case of out of stocks, can my sales associates help, for example looking up inventory availability in other locations? In many retail chains, each store location runs on a different system, and information is saved on a separate database. If all these systems do not communicate with each other in real time, there is a very high chance you might sell an item on your online shop – only to realize, too late, that the product is actually out of stock. You’ll then be forced to tell the customer you don’t have the item they bought – losing the sale, and perhaps, the customer altogether. Ask yourself: Is there unreliable information on my website which is caused by out-of-sync systems? You’d be surprised at how much time companies still waste on doing manually tasks that could be digitized. EKN reports that 64% of retail professionals are still forced to spend time completing physical paperwork during store visits! It doesn’t end there, though, as all these physical documents must then be analyzed and transcribed, manually – wasting more time, and risking more mistakes. Crocodile International, one of our customers, told us how their accounting staff used to spend many hours at the end of each month to manually verify inventory figures against sales orders. This was necessary because they were using legacy systems that didn’t communicate with each other, and the delayed transaction postings meant that they could never know exactly how much stock was available at a given time. Ask yourself: Does entering and double-checking data manually eat up a lot of my man-hours? To engage today’s customers, you must be able to identify them from the beginning of their shopping journey, following them across the multiple channels and touchpoints they use. You must then share this information across your enterprise, and use it to create personalized interactions. This is a hefty goal if, like many retailers, you manage each channel – perhaps each store – as a separate entity. Some companies don’t even have an integrated customer database, and valuable customer information (sales per client, payments, etc.) is stored in separate systems which neither sync, nor communicate with each other. The result? Duplicate information, incomplete and inconsistent records, and no clear view of who the consumer is. And when you don’t know who you are talking to, and what their habits and tastes are, you cannot design meaningful loyalty programs and rewards, deliver personalized recommendations, or offer relevant promotions. In other words, you have no way to create the effective, engaging experiences consumers demand. Ask yourself: Do I have the tools to communicate with my customers in a personal way, or is the data I would need to do that locked away in silos? A real-time view of your retail operations is necessary for timely, effective decision-making. During crucial sales periods and events in particular, lack of insight – and the consequent inability to act rapidly – can seriously harm your store performance, potentially causing lasting damage to your bottom line. Unfortunately, when you are running each location as a separate entity, keeping track of each store’s performance and comparing different locations can become a complex, time-consuming task. And once the outputs from all systems have finally been aggregated into a single overview, chances are that the report you get is already outdated – leading to ineffective, “too little, too late” business decisions. On top of that, when information comes from multiple sources that may be storing or calculating data in different ways, you always run the risk of acting based on inaccurate, incomplete, or meaningless data. Ask yourself: Are my decisions based on current information? Can I trust the quality of the data I use for my decision-making? When you are running your business on multiple, patched-together systems, even basic (and high-profit) activities such as running promotions and changing prices can become complex and costly. One of our customers, a resort with retail stores and restaurants, told us how their old IT setup didn’t allow them to run or monitor offers. The many software solutions they were using could not sync information; this meant that the company couldn’t track the performance of different products. And since they didn’t know what items sold best and which ones were slow movers, they were unable to plan effective offers. Even changing prices can be difficult, when your IT setup hinders you. Auto Milovanovic, a specialty retail company selling spare car parts, used to keep price tables on separate databases and Excel documents. Every time they had to find or set a new price, they ended up wasting a lot of time – and the fact that the process was manual meant that mistakes could, and did, happen. Ask yourself: Can I easily change prices, run new offers, and track the results of these activities in all my locations? In a recent study by Stripe, almost 70% of UK developers interviewed said that their businesses are being held back by outdated and custom-built technology systems. It gets worse. The developers said they usually spend over 17 hours a week (that’s almost half of their working time!) on system maintenance, such as debugging, patching old systems and fixing bad code. Based on the feedback, Stripe estimates that outdated, legacy systems have a negative impact on global GDP amounting to around $300 billion per year. Ask yourself: Are some of my systems so old that they are not even supported anymore? Am I spending so much in system maintenance that I can’t afford to replace the IT? According to The Unified Commerce Landscape Report by IHL Group and NCR, retail leaders spend on average 69% more on IT than other retailers. What matters most, though, is how that money is spent. 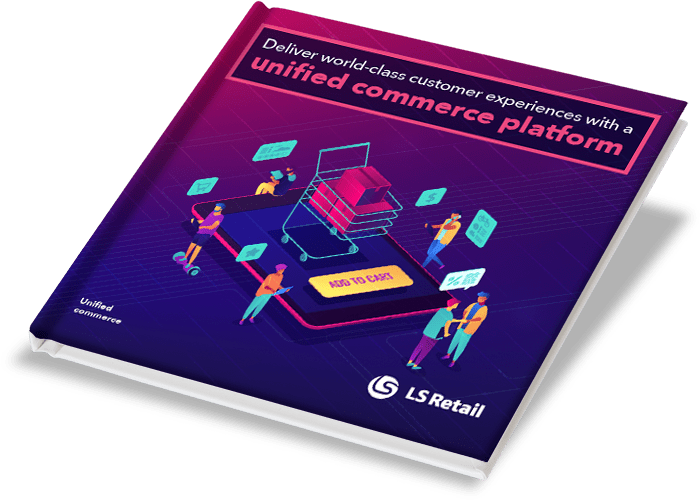 Retailers must do away with the disconnected, legacy systems that are limiting their visibility and their ability to compete, and upgrade to unified commerce. Unified commerce unites all parts of the business within one common platform, which is used across the enterprise, back to front. And when all your key information – from customer data, to product information, to financials – is stored in a single place, you can easily use it in real time across the whole company. No multiple sources of data, no contradicting information, no delays: just one truth, which you can rely on. “The IT spending commitment from retail leaders is having a dramatic impact on their ability to balance the top strategic priorities: creating a seamless shopping experience, creating a ‘WOW’ in-store experience, and improving customer loyalty,” said Greg Buzek, President of IHL Group. If you want to learn more about how a unified commerce platform can benefit your business today and tomorrow, do not hesitate to contact us.